During the winter months, it can be tempting to cozy up on the couch with a movie and a warm bevvie, but you don’t have to forego your adventures and travel plans just because it’s cold outside. In fact, winter is one of Ohio’s most peaceful seasons — and the perfect time to book a romantic getaway with your sweetheart! Our state is home to a variety of cozy lodges and luxury suites, all boasting fireplaces, whirlpool tubs, picturesque views and more to make for a warm, whimsical weekend. We’ve gathered up some of our favorite winter getaways in Ohio, so what are you waiting for? Relaxation is just an easy road trip away. 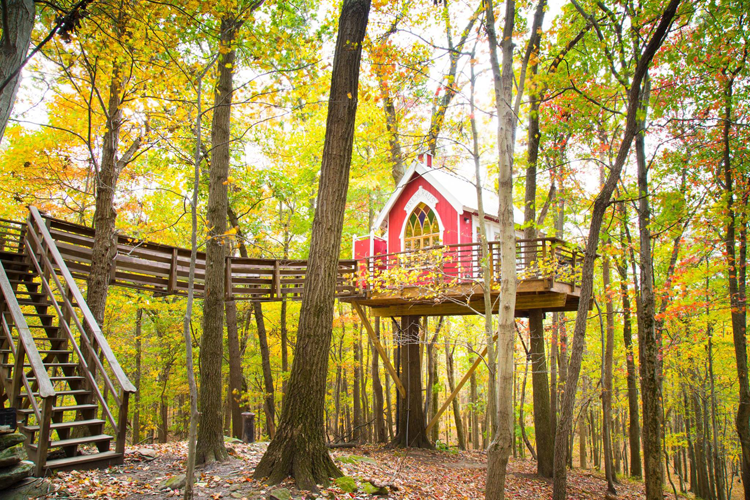 Take your weekend getaway to new heights with a romantic stay at the Mohicans tree houses! And fear not, these luxury abodes are a step above the tree houses you played in as a kid. Each house is custom designed with sleek interiors, stunning views and cozy amenities. Winter is actually the best time to visit these houses, as they are reserved for wedding guests on the weekends from March through December. Little Red is one of the newer houses, and was designed for adventurous couples. 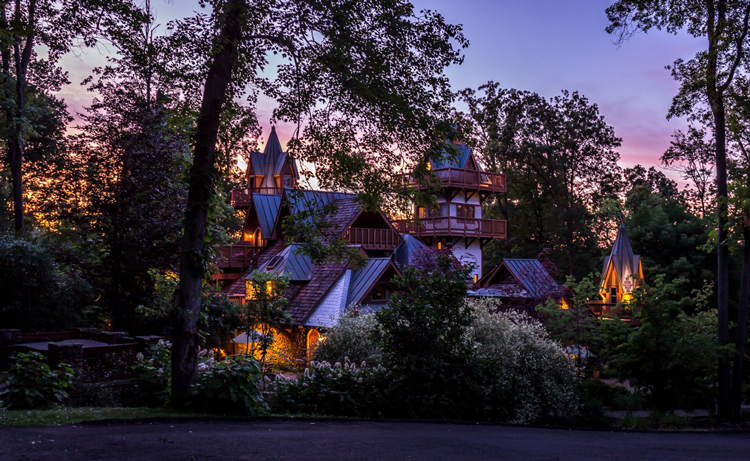 Crafted by renowned treehouse designer, Pete Delson, it was initially created as a brewery and tasting center for Tree House Brewing Company Beer, but has since been converted into a romantic getaway complete with stained glass windows and a lofted bed. We also love the Moonlight treehouse! Tucked away in the trees, this gorgeous house was crafted with 100-year-old barn siding, which makes for a stunning (and cozy) collision of old and new. Enjoy gorgeous views, luxe comforts and a full kitchen to make delicious home-cooked meals. Call 740-599-9030 to make a reservation. Gervasi Vineyard is truly a dream getaway for wine enthusiasts! Set on a 55-acre vineyard, the Tuscan-themed hotel makes you feel like you’ve escaped to another world — without having to leave the state. The villa suites are decorated with gorgeous Italian details, including rustic wooden doors, stucco walls, limestone floors and grand stone fireplaces. Cozy up next to the fire with your sweetheart while you split a bottle of wine from the vineyard, or better yet, venture to the Crush House Tasting Bar! Here, you’ll be able to sample a flight of the vintner’s hand-picked selections for as little as $5. Ready to relax? Treat yourself at the full-service spa onsite, or order a lavish plate of chocolates or cheeses to the room. Call 330-497-1000 or visit this page to make a reservation. Nestled in the heart of Hocking Hills, the Inn and Spa at Cedar Falls is a couple’s paradise. Imagine being immersed in serene natural surroundings, hiking to scenic caves and waterfalls by day, treating yourself at the full service spa, and cozying up in a charming private abode. The cottages are situated on two acres, and come equipped with a whirlpool hot tub, a gas log stove, plush robes, and freshly baked cookies upon your arrival. Call 1-800-653-2557 to make a reservation. Escape to Atwood Lake this season, which is absolutely spectacular at any time of year. 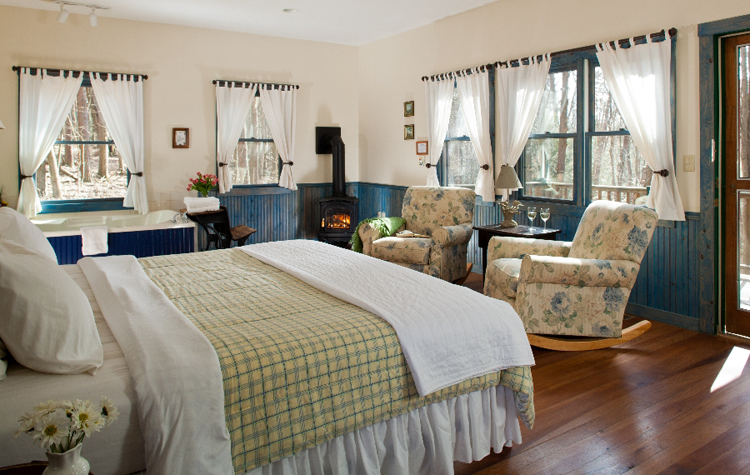 For the best views (and coziest lodging), there’s no better place to stay than Whispering Pines Bed & Breakfast. The lodge is independently owned, and the owners are dedicated to providing everything you need for a comfortable, romantic and memorable vacation. During the day, you can embark on a horseback ride, indulge in a spa treatment, or simply cozy up with a book to enjoy the peaceful setting. Book the romantic getaway package (available December through May), which includes two massages and a $20 credit you can apply to lodging or the gift shop. You can even purchase fresh flowers to surprise your sweetheart at check-in! Call 330-735-2824 to make a reservation. If you’ve always dreamed of staying in a castle, now is your chance! Nestled deep in the heart of Mohican country, this luxury hotel offers easy access to Ohio’s Amish country as well as several prime wineries and vineyards. Of course, there’s really no reason to leave! The hotel boasts a full-service spa, a sauna, a hot tub, in-room comforts and an onsite restaurant — all of the ingredients you need for a memorable winter vacation. Additionally, this venue hosts concerts, comedy shows and mystery dinners frequently during the weekends. Check the event schedule to see if there’s something fun coming up! Call 419-994-3427 or visit this page to make a reservation. This boutique resort offers a tranquil getaway on 56 acres of breathtaking landscape. So tranquil in fact, you might forget you’re in Ohio! Relax in one of the inns 39 charming guest rooms, suites or cottages, each of which boasts a unique personality and a romantic ambience. Opt for one of the club-level honeycomb rooms. These abodes are built directly into the hillside and feature stunning views, a cozy gas fireplace, complimentary coffee, luxe bedding and bathrobes, and complimentary wine and appetizers in the Tarragon Lounge. When it comes time for dinner, there’s no need to leave the property — the Tarragon at the inn is an award-winning restaurant featuring contemporary American cuisine crafted with fresh, seasonal and delicious local ingredients. Call 330-674-0011 or visit this page to make a reservation. 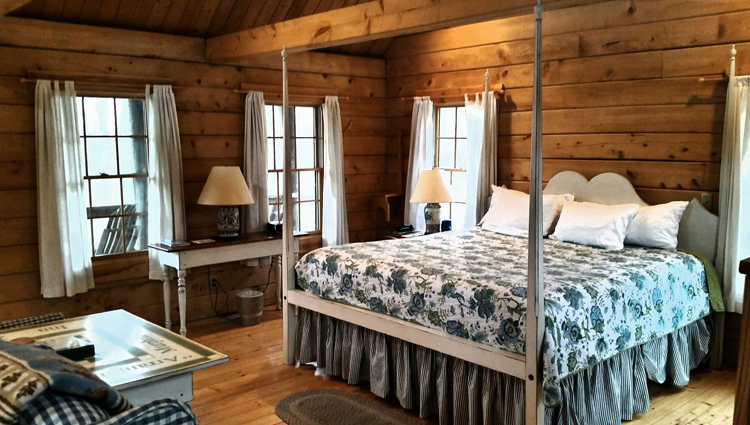 Situated on 142 acres of rolling woodland and farmland, Murphin Ridge Inn offers breathtaking views of the Appalachian foothills, and is the perfect spot for a romantic getaway year-round. During the winter months, guests can drive through the neighboring small towns to take in the sights, shop for antiques, and snack on freshly-baked goods. When you return, enjoy dinner in the onsite restaurant, gather around the outdoor fire pit, or cozy up with a book in your private cabin. Of course, we would come for breakfast alone — which includes sweet and savory options like warm coffee cakes, biscuits and gravy, hearty pancakes, and freshly squeezed orange juice. Call 938-544-2263 to make a reservation. 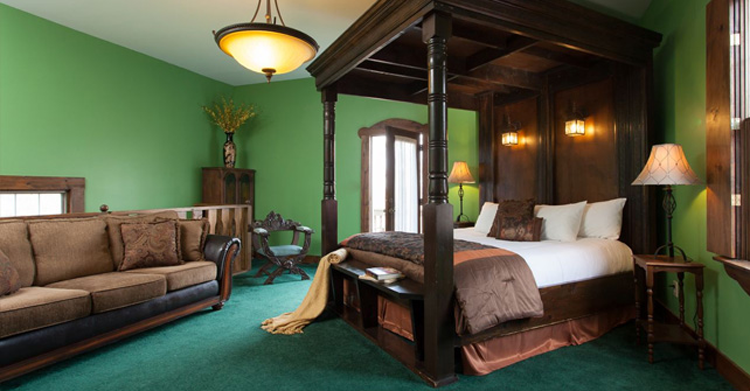 Dive right into Ohio’s Amish culture at the German Village Guest House. Here, you’ll enjoy easy access to one of Columbus’ most popular neighborhoods (Jeni’s Splendid Ice Cream, anyone? ), and a tranquil place to relax and rest your head. The house was built in the late 1800s and converted to a hotel in 2005. Today it combines old and new, allowing a glimpse into Ohio’s history while providing a luxe experience. Guests will enjoy a full continental breakfast buffet in the morning, fresh flowers in your room at check in, and comfortable amenities. You might even be able to sample one of the owner’s freshly baked breads, cakes and pastries. Call 614-437-9712 to make a reservation. Nestled in the woods of the scenic Hocking Hills, Ravenwood Castle is a place all Ohio residents should visit at least once. The rooms are decorated with charming Victorian-era elements and four-poster beds, and the amenities are nothing short of luxe. Highlight rooms include the King Arthur Suite, which encompasses one of the castle’s towers, overlooks the formal gardens, and includes a whirlpool tub for two, and the Queen Victoria Suite, a romantic abode bathed in whimsical decor. We also love the Brewer’s Cottage, a new addition to the castle which offers a bit more privacy, picturesque wooded views, and a kitchenette. Regardless of where you choose to stay, we guarantee that this will be a vacation to remember! Call 740-596-2606 or visit this page to make a reservation. Whether you’re looking for a luxury suite or a charming, B&B-style room, there’s a little something for everyone at the Hideaway Country Inn. People flock here from all over the state for the tranquil atmosphere, natural surroundings and nearby attractions. The inn is located north of Columbus and south of Cleveland, which means it offers easy access to small towns for exploring, the Ohio wine trail, and more. The luxury and loft suites are possibly the most romantic option, featuring two-person whirlpool tubs, cozy fireplaces, picturesque views and unique decor. Call 419-562-3013 to make a reservation!